The exhibition was held in the Rare Books Exhibition space, Sir Louis Matheson Library, Monash University from 22 October 2003 - March 2004 Opening address given by Peter Spearritt. 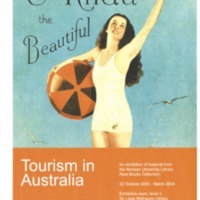 This exhibition on Tourism includes material that shows how we Australians have promoted ourselves to others at various times in the past. It provides some intriguing insights into how tourism has evolved, not to mention the strangeness of seeing familiar places in the past. For example there are some fascinating and rare guide books giving people tours of Melbourne and suburbs in 1870's and 1880's.